A true bulb, such as a daffodil or tulip bulb, is a fleshy underground root structure that has a tunic (skin) that covers the fleshy scales. At the bottom is a basal plant, and on top is the shoot where the flower grows. A bulb also self propagates and forms small offshoots on the sides. Fortunately, with close inspection and some fertilizing at planting time, your old bulbs are likely to grow and thrive just as your newer bulbs. 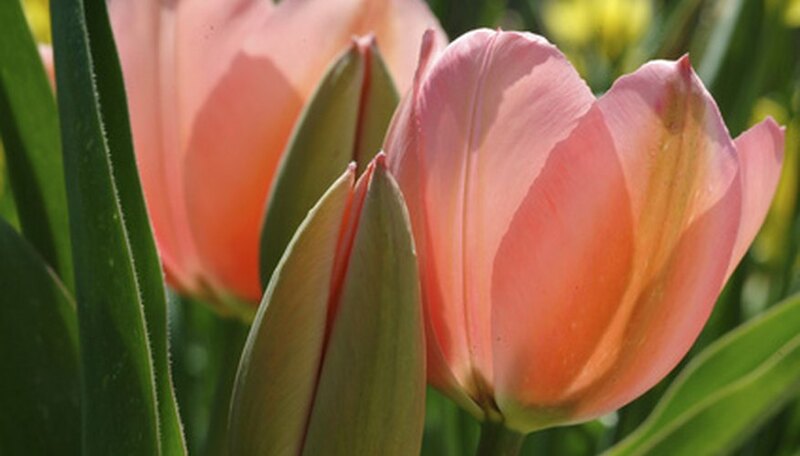 Plant old bulbs in full sunlight and in the fall so they can become established during the winter months. Examine the old bulbs to ensure they are firm and plump, free from mildew and not shriveling. Separate any offshoots by hand and plant them as well. Discard any bulbs that do not appear healthy. Plant the old bulbs near the back of the garden or intermixed with newer bulbs to ensure a balanced-looking garden should the old bulbs fail to grow or bloom. Turn over the top 12 inches of soil with a hoe or tiller and mix in 2 or 3 inches of compost, shredded pine bark or another similar organic matter. Incorporate 1 to 2 lbs. of 10-10-10 fertilizer (quick-release) for every 100 square feet. Sprinkle 1 tsp. of bone meal into each planting hole. Plant the old bulbs three times as deep as they are wide. Give the bulbs 1 to 2 inches of water. Cover the area with 3 or 4 inches of mulch, such as bark, to protect them from winter freezing.